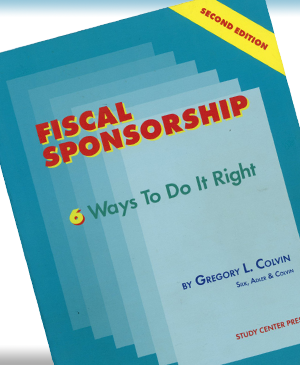 Fiscal Sponsorship: 6 Ways to Do It Right, Greg Colvin’s seminal study of fiscal sponsorship. http://www.fiscalsponsorship.com/, the Website of attorney Greg Colvin, author of Fiscal Sponsorship: 6 Ways to Do It Right. National Network of Fiscal Sponsors, leading association of fiscal sponsors, a force in professionalizing the field. Fiscal Sponsorship: Understanding Current Practices and Needs, National Network of Fiscal Sponsors’ 2006 survey of 111 fiscal sponsors. “Fiscal Sponsorship Is Maturing as a Field,” by M. Melanie Beene, former executive director of San Francisco’s Community Initiatives. Beene’s article originally appeared in the Fall 2010 edition of Grantsmakers in the Arts Reader. “The Use of LLCs in Fiscal Sponsorship — A New Model” — Attorneys Steven Chiodini and Gregory L. Colvin discuss Model L, in which the fiscal sponsor acts as the sole member of a limited liability company from which the sponsored project is conducted. Taxation of Exempts, May/June 2011. “Fiscal Sponsorship: A 360 Degree Perspective,” a 2014 white paper by Trust for Conservation Innovation. “Fiscal Sponsorship: What You Should Know and Why You Should Know It,” by Erin Bradrick, senior counsel at NEO Law Group in San Francisco, and a contributor to the Nonprofit Law Blog. In Business Law Today, Website of American Bar Association, 2015. GuideStar Nonprofit Compensation Report, 2015 edition, nonprofit compensation analysis of 14 job categories at 105,406 exempt organizations based on their 2013 IRS 990 and 990-EZ forms. 2016 Compensation & Benefits Survey, annual compilation of Southern and Central California nonprofit employees’ salaries, published by the Center for Nonprofit Management. “Advancing Fiscally Sponsored Arts & Arts Projects,” comprehensive report on New York City’s 3,130 fiscally sponsored arts projects, 2017. “Fiscal Sponsorship: A Hidden Resource for Nonprofit Entrepreneurs” February 21, 2018, Nonprofit Quarterly. Fair Pay for Northern California Nonprofits: The 2018 Compensation and Benefits Survey Report, 610 nonprofits reporting on more than 32,000 jobs, published by Nonprofit Compensation Associates. The Directory is a free resource for fiscal sponsors, projects looking for fiscal sponsors and the general public. There’s NO fee to be listed in the Directory or paywall to use it. And we want to keep it that way. If you’ve found the Directory useful, help us support it so we can maintain the listings and bring you practical, timely news about the field.